Our Instructors at the Korean Martial Arts Academy have been trained in specialised classes, to ensure their classes are of a high quality standard. All classes have specific requirements that each Instructor has to meet as well as individual training goals for the students. All Instructors are trained to provide the best possible training sessions to meet these goals. All KMAA instructors are required to attend regular staff training sessions to ensure their classes are constantly improving and remaining at a high standard. Sir started his martial arts journey over 30 years ago after being inspired by a local Taekwondo demonstration. Since then, he has been heavily involved in the Australian Martial Arts community. Sir believes that Taekwondo offers not only a physical but mental challenge which continues long after a student has reached their Black Belt. Sir is committed to providing a quality martial arts experience and service to all students, parents and visitors to KMAA. Miss Debra is a bright and valued member of KMAA's Administration Staff. She is dedicated to ensuring all students and parents feel welcome and enjoy their experience. Miss Debra is a friendly member of the KMAA community and is dedicated to her own training as well as assisting others in and out of her classes. Mr Man enjoys incorporating as much fitness and kicking into his classes as possible. He is always looking for ways to improve basic techniques and drills as well as challenging his students. Mr Man is committed to ensuring all students get as much out of their training as possible while also making classes fun! Ms Christine has impressively attained the highest graded level for two weapons styles and is currently working on her third. She is a friendly member of the instructing team and has contributed to the creation and improvement of the weapons and self defence program requirements. Miss Kay has a passion for working with a variety of weapons (having attained the highest level in 2/3 weapons), is very interested in Korean culture and language, and loves focusing on the use of effective technique when instructing classes. Miss Megan is committed to ensuring all students have a quality experience at KMAA. She is an extremely dedicated member of the KMAA community having been an instructor for over 7 years. Miss Megan is a friendly and approachable staff member who is always available to answer any questions and to help any students or parents. Miss Megan works hard to ensure all members of the KMAA community feel valued and supported. 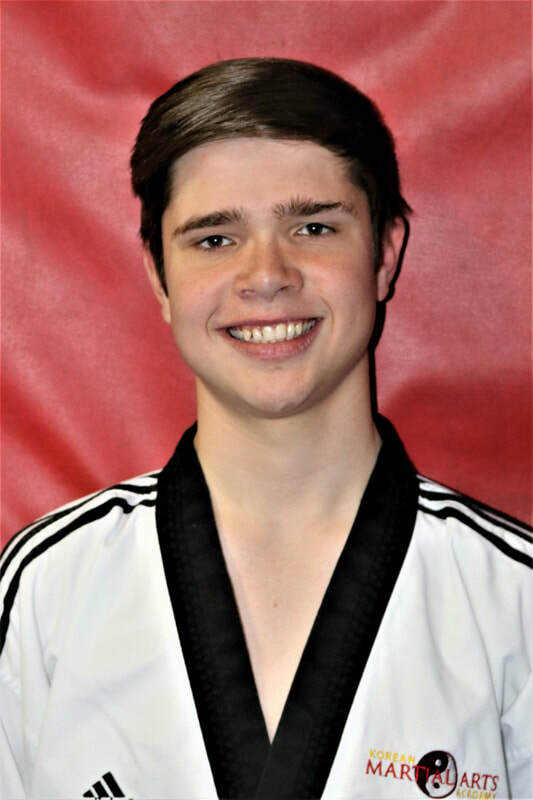 Mr Lachlan is a dedicated member of the KMAA community and has been involved in running classes since he was 13 years old. Mr Lachlan enjoys watching his students develop and move through the programs and is committed to ensuring they enjoy and benefit from their training. ​Mr Faissal is an outgoing and fun member of the KMAA community. He is committed to providing quality classes for students in the Pandas and Tigers programs and enjoys watching them learn and grow. Mr Faissal enjoys creating new and exciting ways to instruct children and always has fun teaching his classes. Mr Tim is a fun and enthusiastic Instructor and a Nunchuku master! He has an indepth knowledge about all aspects of Taekwondo taught at the Korean Martial Arts Academy and is committed to ensuring all his students are learning and progressing at the correct level and pace. Mr Patrick is a loud and enthusiastic instructor. His classes are always energetic and he always ensures his students have fun. Miss Annika is a valued member of the KMAA staff team. She is always willing to provide feedback on the students and classes and has a bright and friendly personality. KMAA's Assistant Instructors are a fantastic team of students who have demonstrated dedication and focus in their own training. They have been selected by the Instructing Team as potential Instructors and undergo continual training to enhance their leadership skills. They are enthusiastic in their role and a valuable asset for all students and Instructors. All KMAA's Instructors and Assistant Instructors have completed the Korean Martial Arts Academy's Leadership Development Team Training Program as well as attend monthly training sessions. All KMAA's Instructors are committed to their individual training and improvement as well as the training and development of the students.